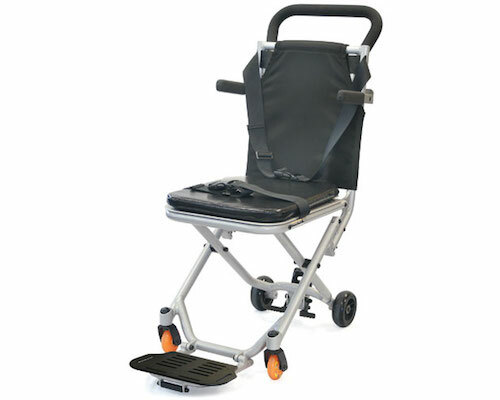 The Melrose Folding Onboard Aisle Wheelchair has been specially designed to fit down narrow passages and then folded up and stored. It will fit into tight spaces like non-disabled public toilets, aircraft aisles, bus aisles, caravans and anywhere else your day wheelchair might not fit. This model folds down to only 230mm in height and 380mm wide so you can store it under the bed or in the corner of a wardrobe. Two catches lock the chair into place as you unfold it, while two pins lock the push handle into place. Armrests fold down, these can help to provide lateral trunk support as well as the chest strap.